Posted by jek on Sun, 07/27/2008 - 14:50.
how will i use this?! does this work good?! Posted by Am on Mon, 02/25/2008 - 00:00. Posted by chris on Fri, 12/09/2005 - 18:30. Posted by meatris hunt on Thu, 01/06/2005 - 22:07. Posted by Tumisang on Fri, 11/28/2003 - 07:36. 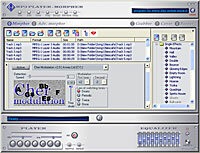 I am a music maniac, and just want to know if i can get a software that can chage the tempo of a CD while still playing? Posted by maniac on Tue, 02/06/2007 - 22:24.
: I am a music maniac, and just want to know if i can get a software that can chage the tempo of a CD while still playing?